REO UK Ltd, the manufacturer of power quality and power management equipment, now carries a full range of equipment for screened rooms and test facilities. For testing equipment under load conditions REO can provide a range of resistor banks. These units are constructed from standard resistor modules, with connections brought out to a terminal panel to allow series or parallel connection. Typical of this range is the REOLOAD 310, a three-phase load bank rated for 48kW, with fan cooling. The front panel layout includes a switch panel for configuring the separate resistor modules to give the required resistance and current range. There are also digital panel meters for displaying the phase voltages and currents and an interface for PLC control. For EMC testing, it is essential to ensure a clean supply to the screened room that is free from interference. 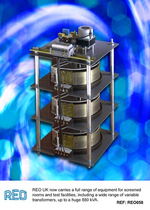 Specifically to meet these requirements REO has designed multi-stage filters with high attenuation across a wide frequency band of 14kHz to 1GHz. Several versions are available, for 1, 2 or 3 conductors with ratings up to 500V and 400V per phase. For testing at various voltages, REO also manufactures a wide range of variable transformers, up to a huge 880 kVA. Toroidal or column transformers can be supplied depending on the power rating required. Output is virtually stepless and there is no sine wave distortion. Motorised adjustment is available for all models. The range of standard three phase variable toroidal transformers provides up to 3 x 34A per phase on a 3 x 400V supply. The range is complemented by a series of electronic regulators which control the motorised variable transformers in response to an analogue signal.